I have decided that Sundays will now be Pinterest days. What does that mean? It means every Sunday I’ll be sharing a bookish craft with you all that I found on Pinterest. Obviously, none of these craft ideas were created by me, and I’ll give the creator the credit he or she deserves. I just want to share some cool and fun—and maybe even new—craft ideas with you. And maybe I’ll even scrounge up the willpower to actually do the craft one day. Who knows? 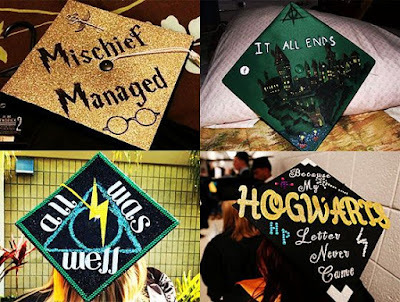 I’m graduating in five months and I think it would be really cool to decorate my cap with something fandom-related. That’s the only way I would do it, simply because I like puns and witty comments. I tried the pretty graduation cap decoration in high school and I ended up not liking it, so funny stuff it is. If you can think of any other cool graduation cap ideas I should mull over using, you should let me know. I know some people think decorating your college graduation cap is lame, but if I figure out the right idea, I’m going to do it. What do you guys think? Yay? Nay? Maybe? Sound off in the comments. Also, if you’d like to follow me on Pinterest, you can do so here. Or, if you just want to check out what bookish crafts I have saved so far, you can go here. I love these so much! I'm also graduating soon and I definitely want to do something either involving Slytherin or Superheroes because I'm a huge captain America fan. Maybe I can do both!